Once upon a time, the relationship between hip-hop culture and the world of consumer products was one-sided and unrequited. The early DJs and MCs, b-boys and b-girls were zealous consumers and fans, but largely invisible to the corporate brands they religiously used. In the world of hip-hop, brands could be an especially important emblem of identity. 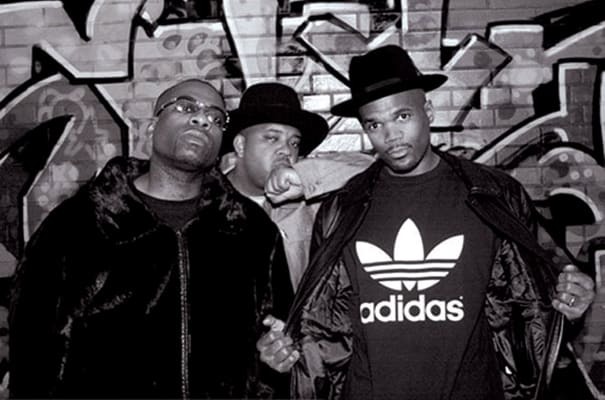 No rap act exemplified that self-branding impulse more than Run-DMC, who made Adidas sneakers and sweat suits a part of their official costume. So when Run-DMC recorded and released the heart-on-their-sleeves single “My Adidas” in 1986, they did so out of enthusiasm for the brand, with no thought to compensation. But the song was too much of an advertisement for Adidas for the company to miss. A former European soccer star named Angelo Anastasio ran a lonely outpost for Adidas in Los Angeles, an outreach office to the world of sports and entertainment in a time before that kind of thing became de rigeur for sportswear companies. Anastasio already knew about Run-DMC when Russell Simmons and Lyor Cohen invited him to see the group perform “My Adidas” at Madison Square Garden in New York. The sight of tens of thousands of rap fans holding their Adidas aloft moved Anastasio to tears—and to urge his superiors to bestow Run-DMC with a million-dollar endorsement deal, the first of its kind in hip-hop. The Adidas deal marked the end of hip-hop’s corporate invisibility, and a growing realization of the power of hip-hop as a marketing tool for corporate brands. It would be a harbinger of even more lucrative deals to come.